Home / Android / App / App Review / Food & Drink / iOS / KtchUp / KtchUp - Where Shall We Eat? If you own a smartphone, you already know how incredibly useful it can be for finding nearby businesses. And if you eat out regularly, you may search for restaurants as much as any other type of service. Being able to quickly locate an eatery in close proximity can be useful, especially if you're in unfamiliar territory. In this article, we look at one of the top rated restaurant apps that you can install on your smartphone, called KtchUp. It has a unique combination of features to help you decide where to dine, so read on and find out everything. KtchUp is a stunning and powerful restaurant tool for exploring and finding different places to eat with your friends. Whether you can’t find a good place to catch-up or you can’t agree on a restaurant, the app has got you covered. It is designed with intuitive UI, great graphics and available on both Android and iOS platforms. Planning and organizing a lunch or dinner and agreeing on a restaurant can be challenging and time consuming. Now, with the KtchUp app that task is hassle-free. Just create a group hat with your contacts (even those not on the app), swipe to vote for restaurants you would like to eat at, and book a table with one tap only. The app also offers useful restaurant photos and info, like hashtags, websites, menus, locations, links to book, etc. 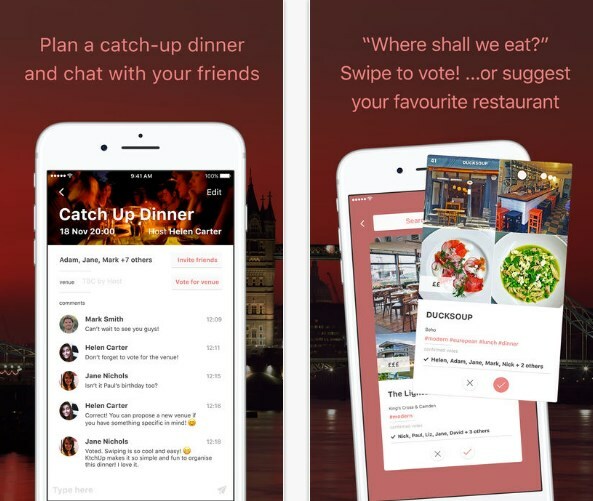 You can also explore a list of restaurants that your friends recommend in different areas of London on your homepage, “Like” restaurants so the app can suggest them to you next time you are organizing a dinner or lunch in London, and so much more. Plan a perfect catch-up dinner with your loved ones, download KtchUp for free from one of the following links that suits your device.